TWA 800 COVER UP! The federal exhibit WARNING given to a federal judge ONE YEAR before tragedy occurred! Worlds top mystic put details of TWA 800 in US court case in early 1996! In case 96CV 1499 in the US Federal court system is a document about TWA 800. It was placed into that case as an EXHIBIT in early 1996. It was written in 1995. It has been on file since BEFORE the TWA 800 tragedy occurred. Yes, minute details of TWA 800 were actually placed before hand in a federal court record in Philly! This document has been mentioned recently on several nationwide radio talk shows, such as the Alan Colmes show and Sightings on the Radio with Jeff Rense! Even the Washington Post mentioned the case. They say it's a HOAX. That's why we have offered $100,000 to anyone that can prove the document is fake! The case is bizarre to say the least. It was filed by Sollog Immanuel Adonai-Adoni. He has a very popluarweb site and is one of the most written about people on the www. He is the same person who also FAXED the details of the Oklahoma Bombing to 60 executives that control the US media, before it happened! You might remember how the media mentioned back then, THEY WERE WARNED! We have a link to THE WARNING about TWA 800 that was placed in a Philadelphia Federal court document! It unequivocally states that a plane tragedy would occur and it lists New York near CONEY ISLAND at 1300 in the document! It was written ONE YEAR before TWA 800 exploded at 13000. THE WARNING warned of plane crashes and mentions the area where TWA 800 Exploded two years later and it mentioned Jackson Hole Wyoming and a warning about a Presidential Plane Crash involving Bill Clinton. For writing this WARNING titled THE CHEESEBURGER WARNING, the writer Sollog was arrested by the US Secret Service. The case was withdrawn. One year later Bill Clinton went to Jackson Hole despite the Sollog WARNING and his support plane crashed and SECRET SERVICE AGENTS DIED in the crash. Had Clinton OBEYED the Sollog WARNING, Secret Service Agents would not have died! So that WARNING is the exact document used in the Sollog Arrest as an exhibit by the US Secret Service and it was put into his case SUING the US Government for FALSE ARREST. We have a $100,000.00 GUARANTEE it is authentic. You can verify the document and case is real through PACER, that's the US Federal governments own computer system for Public Acces to Court Electronic Records. Why was the WARNING placed in a Federal court record BEFORE TWA 800 occurred. The person who wrote the WARNING says he was sent to WARN of NUCLEAR TERRORISM that is about to strike ISRAEL, Rome and Washington DC! The same TWA 800 document also warned of Valujet 592, since it listed MIAMI as the site of a crash as well. It also stated that Clinton should not go back to Jackson Hole Wyoming on vaction or a TRAGEDY would occur. One year later NINE people died in a US Presidential Support plane crash. It also warned Clinton to not GOLF near Miami and look out for a leg injury. Clinton later injured his leg on a Golfing trip near Miami. The author of the WARNING was actually arrested in 1995 by the US Secret Service for writing this document. They said it was a threat. The case was withdrawn. 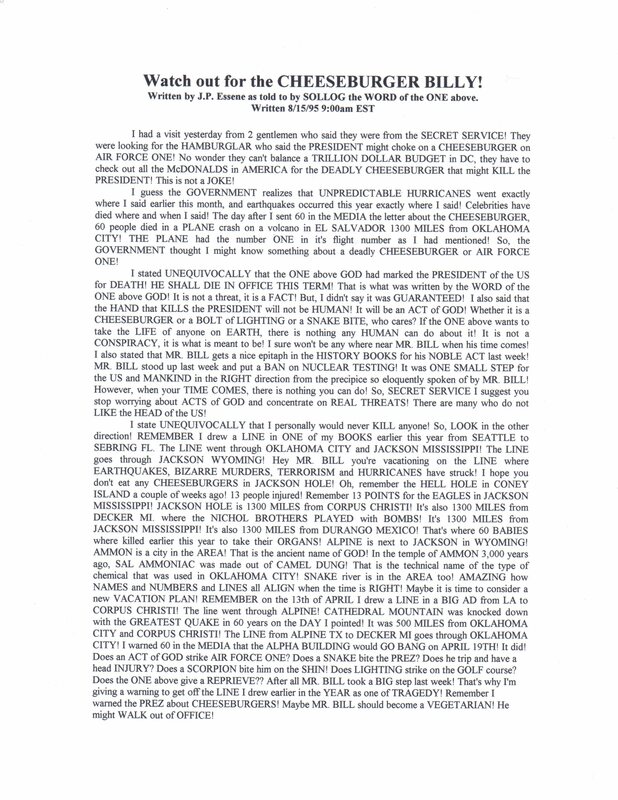 More BIZARRE is the FACT that only one page in about 300 in the case filed by Sollog is called a PROPHECY. That PROPHECY stated Clinton would trip and fall. In the same paragraph it stated Diana would die in France on 831! It is known as the May 13th Prophecy. Three days before Oklahoma City went bang, 60 major executives in the American Press that control every thing the American people read and hear, were warned by FAX by Sollog that a bombing would occur on April 19th. On that very day the Federal building went bang. You probably remember hearing initially about the WARNING FAXES. They were sent by Sollog and he was detained by the US government immediately after the bombing occurred! He named the building and published the death count ONE MONTH before it happened in a Philadelphia Weekly news paper! Even the details of Rabin's assassination were given to a Federal judge in Philadelphia ONE MONTH before it happened by Sollog, at his arraignment for writing this document that he was arrested for. We have the court transcripts that prove it happened! The man named Sollog is also called "The Nostradamus of the 90's" by the UNDERGROUND media. A phrase coined by the editor of CIAO magazine. He was called the Master Mind by Bill Clinton. Remember how the President said some Master Mind was behind the Oklahoma bombing. That's because he was aware Sollog knew the exact details before it occurred! The warning letter that predicted TWA 800 and the presidential crash in Jackson Hole is a Federal Exhibit for all to see in Philadelphia. TWA 800 Disaster where Sollog warned! JFK Jr Dies in Plane Crash as Sollog warned! Diana's Death in France on 8/31 as Sollog warned! Oklahoma City Bombing on date Sollog warned! Rabin's Assassination on date Sollog warned! Mike Kennedy's death on date and how Sollog warned! SwissAir 111 on date Sollog warned! US Embassy Bombings on dates Sollog warned!